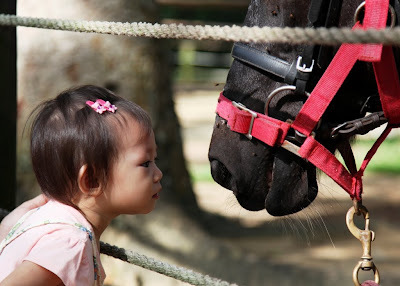 A. Mei took us to the Gallop Stables at Pasir Ris park with the kids. We had planned for a nice brunch but unfortunately the cafe was closed on New Years Day! We did see the horses and ponies though. Ethan liked them... for about 60 seconds, after which he was bored... but Talia was totally fascinated with the animals. The trip was worth it to see her eagerness and longing look at the gorgeous horses, without any fear at all.